T-Pain & AArrow - Everything Must Go! Since his first hit single “I’m Sprung” was released in 2005, T-Pain has been everywhere. While he was at the top of the charts with hits like “Bartender” and “Buy U a Drank”, those songs definitely ended up on quite a few sign spinning playlists as well. That’s why we at AArrow were so excited when we were asked to promote T-Pain’s new collection of music “Everything Must Go”. 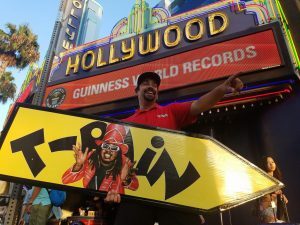 We put not just one, but two AArrow Sign Spinners at one of the most photographed and visited intersections in the world : Hollywood Blvd and Highland Avenue. Hundreds of people every hour stopped, stared, and took photos of our bright yellow signs and amazing skills. Check out “Everything Must Go” at the Official Website for free streaming and downloads, and visit TPain.com for more new music!